Sushi. A beautiful gift to mankind. I am a huge sushi lover. I was first introduced to sushi as a young kid, and my love for it has grown every year since. I have never been a picky eater and my dad has always been able to get my sister and I to try new foods by taunting us with a simple tune that goes: "try it, you'll like it", until we eventually tried whatever new, mysterious food was in front of the younger versions of us. Nowadays, I'll try just about anything. I think I have my parents to thank for that. So, sushi has never been scary to me. In fact, I think in high school I might have had a bit of a problem. I remember day dreaming about sushi in my first class of the day, wishing I had it for lunch instead of my usual turkey and avocado sandwich. I live in Prague now, as some of you may know, and I live on a serious budget. As much as I would love to eat sushi for breakfast, lunch, and dinner, I know that is unfortunately not possible or reasonable. But I have developed a newfound hobby to cure my cravings: making my own sushi. I used to think people who made their own sushi were talented, wealthy folks who must have a lot of time on their hands. But instead, through my own ventures of sushi making, I have found that it is quite the opposite. The process is simple and the ingredients are cheap. Now, I must state a disclaimer. I left out any type of animal products (namely fish) from my sushi. 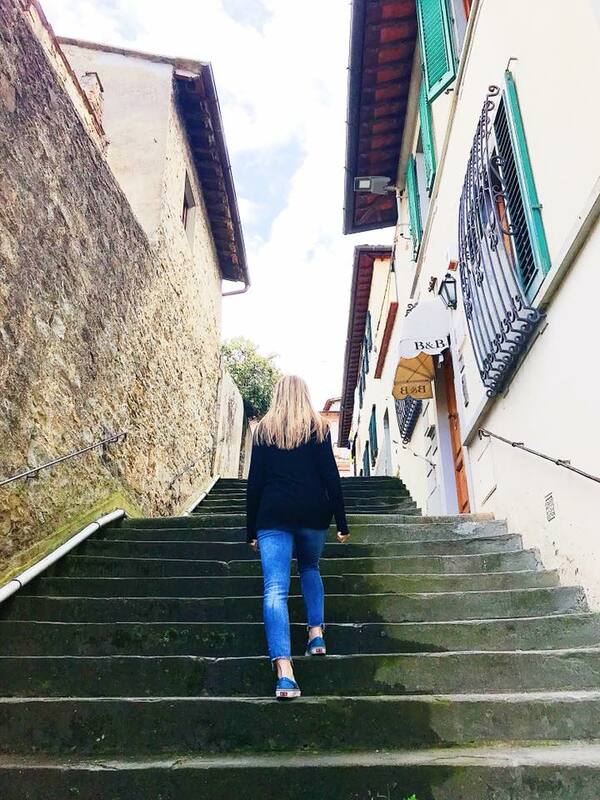 I am dipping my toes in a plant-based lifestyle currently (I was pescatarian for five years, and in 2016 I re-introduced meat back into my diet - more on that another time). 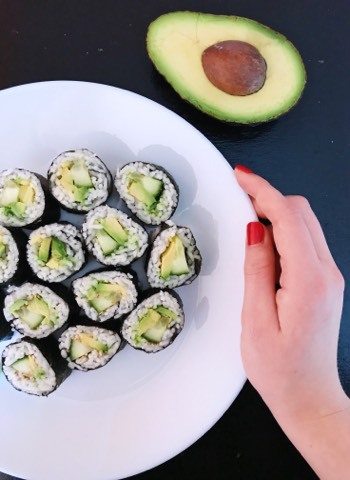 Going plant-based has been pretty easy for me so far, and homemade sushi has been one of my go-to's for lunch and/or dinner. Without fish, this is a cheap meal, however adding fish might increase the price tag a bit. Rice. I used white jasmine rice for this batch. I wasn't able to find sushi rice in my local grocery, which is when I realized that sushi rice is not completely necessary for making sushi; however, I'm sure it wouldn't hurt. Avocado. I like my avocados only semi-ripe for sushi making. I don't like the texture of mushy avocados, especially not in sushi, which is already prone to falling apart if you're not careful. Cucumber. Any variety will do. Nori. I buy a big pack of at my local health food store. It lasts a long time and it's very versatile. Sesame seeds. Optional, but recommended. Mayonnaise-siracha mixture. Also optional. Think: guilty pleasure. I think it's important to note that sushi is fun because you can adjust the filling to your tastebuds. Depending on the day, I like adding mango, red onion, mushroom, spinach, or really any other vegetable or fruit on hand. The beautiful part about sushi is that you can really make it exactly how you want it. I am living pretty minimally these days, and truth be told, my roommate and I don't have measuring cups. So I make a solid guess on my rice-to-water ratio and start my rice on the stove. I recommend following the directions on your rice package, it knows your rice better than I do. While your rice is cooking, set up your other ingredients. 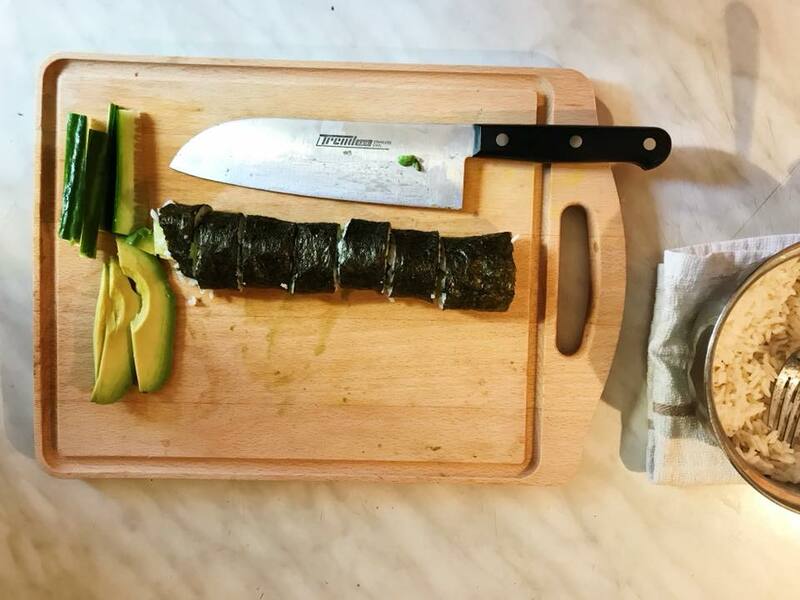 I slice up my avocado, cucumber, and lay out my nori sheets on a wooden cutting board. Once the rice is finished, let it cool a bit before taking handfuls and spreading along half of the nori sheet. I personally like a thin layer of rice, but again, this is your roll, do with it what you will. 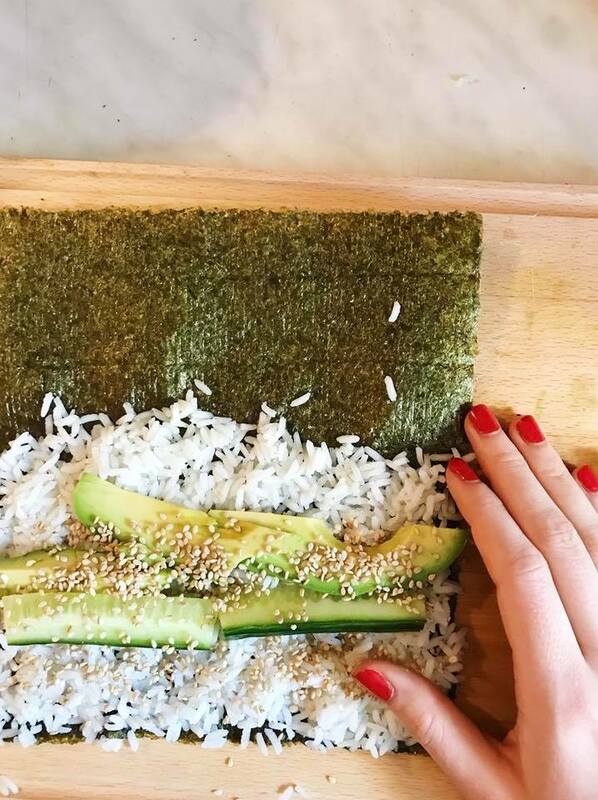 :) After the rice is spread on the entire bottom half of the nori sheet, add your avocado and cucumber next to each other in a horizontal straight line across the middle of your rice patch. Sprinkle some sesame seeds on top and begin the rolling process. Starting with the bottom of the nori sheet, fold it over the vegetables, and begin to tightly roll the nori. Make sure you have a good hold on it to prevent it from falling apart. Once it is rolled tightly, slice the soon-to-be sushi roll in half and then into quarters. Again, the size of your pieces is a personal preference. I really recommend having a good, sharp knife for this process. Plate it nicely and serve alongside soy sauce and a nice mixture of mayonnaise and sriracha (my favorite brand of plant-based mayo is Just. It doesn't exist in Central Europe, unfortunately!). Feel free to sprinkle a few more sesame seeds on top and enjoy! The best part of this simple meal is the tremendous amount of health benefits packed into one roll. 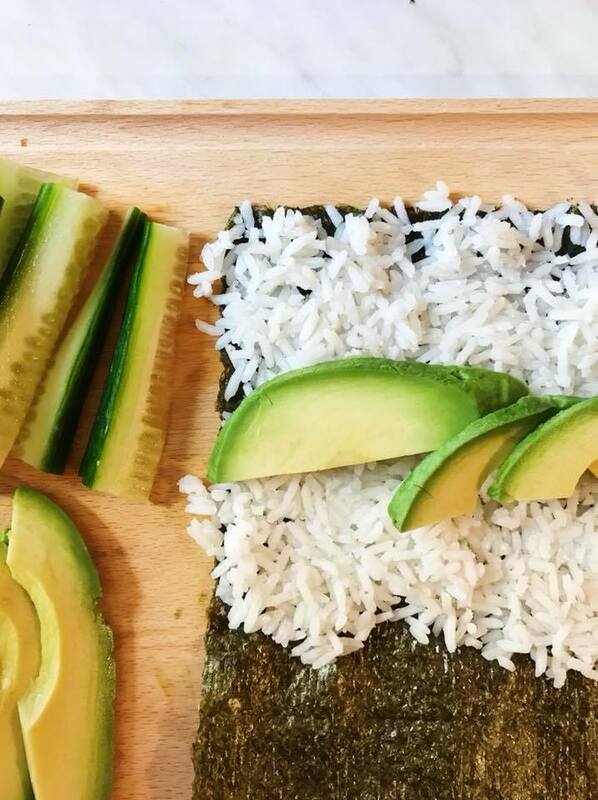 Nori is incredibly dense in essential vitamins and minerals, avocado is loaded with vitamins, fiber, and healthy fat, cucumber is heavy in A, B, and C vitamins and is incredible for digestion, and of course the health benefits of rice are outnumbered.